Once again three members of The Bearded journeyed together through a fun night of gaming. This time Sten was able to make it out while Mike had to spend time with the family and couldn't find the free time. Lee and I were in attendance once again as well. We were able to intro some newer games to not only Sten but all 3 of us with a play through of a new purchase and an expansion we haven't gotten to play as of yet. The day steadily dimmed into the night and many victory points were won and lost. All in all, a fantastic pilgrimage to that holy sanctuary we call board gaming. Still a rather new game for the group, but a first time play through for Sten. I'm personally enamored with the simplicity and entertainment value of the game. Such a solid game for being so simple. I'll be carrying my copy around with me at BGG.Con this year in case we find some down time between our filled grocery list of new games. Another rather new game for the group and only the second game night we've owned it. This was a first play for Sten who did really well. I on the other hand found myself down by two hit points after the first round because I became overzealous. Alas, this is another one I'll be dragging around BGG.Con for those rare down time games. The third game of the evening was a new one to all of us. I picked this up almost a year and a half ago and it has slept on my shelf ever since. 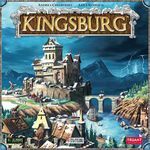 Recently I watched one of the Top 10 lists from the Dice Tower and someone mentioned Kingsburg as a game they enjoyed. After reading through the rules and watching a couple of videos on it we gave it a shot. Very fun dice rolling game! Some of the reviews I'd read about it were rather negative which is part of the reason it didn't join us on the hunt since I purchased it. Pleasantly surprised by this game. After working through the kinks of the game we'll have to get this one back to the table as soon as possible. And I hear the first expansion is a must buy. I'll have to look into that. Next we played a game Sten has been working on for the better part of a year. We've played it a number of times back when he created the game by hand. Since that time he was able to get a prototype properly created and we gave it a try. The game is called Minutes to Midnight. The theme centers around the doomsday clock created after WWII. It's a card driven game that plays similar to a classical card game (though I won't mention which one for the protection of his game). Some of the additions to this classic game really make the game enjoyable. And like any good game designer, Sten listens to our critiques, going so far as to jot down comments we make in passing as possible fixes for the future. We've been encouraging him to get this in front of a publisher. He'll be attending BGG.Con this year, so maybe he can find some time to push his product. It's been a while since I've seen any Dominion cards hit my table. And like any good fan of the game I've been diligently buying up the last expansions as they hit the store shelves. We couple Dominion Intrigue with Guilds playing one of the scenarios included in the Guilds rule book. First time playing Guilds was rather enjoyable and I always remember why I like this game so much. I may have to start insisting that we get at least one game of Dominion played at least once a month with The Bearded. As mentioned above, we coupled this expansion with Intrigue. I liked it, though to be fair, some of the cards called for the use of the Guilds coins and they seemed rather pointless at times. I see the advantage of the coins. Collect them until you have enough to team them up with your hand coinage and go for that big score. 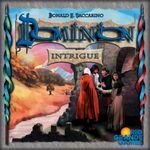 Overall I liked the expansion and will periodically include it in my Dominion plays. Once again Hanabi finds its way to the table near the end of the night when we want to play a lite game. This time we included the "Wild Cards" as their own firework deck which always makes things more interesting. Overall we had a problem with getting red and blue cards out, but we were able to finish 3 fireworks before we blew our fuse. 20 points later the crowd was pleased. Sten had to work Saturday morning and needed to get some sleep so he took off. This left Lee and I to play a two player game. We reached for one we both thoroughly enjoy. Omen: Reign of War is always welcome at the table. I have the game with the Forgotten Oaths expansion but we just went with the base game. It was a close game but Lee ended up taking the victory on a last round assault.